7 APRIL 2010: While in LA filming Desperate Housewives, John also recorded a voice part for an upcoming episode of the Marvel animated series, The Super Hero Squad Show. John was excited to meet Marvel icon Stan Lee, writer, editor, comic book creator and former president of Marvel comics, who has been associated with Marvel for 70 years. Stan was recording a voice part for Super Hero Squad too. The show is on Cartoon Network in the US, and on Nick Toons in the UK. 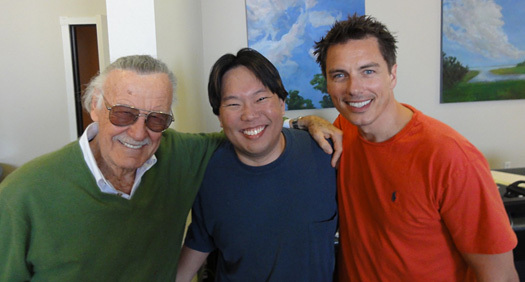 Stan (left) and John are pictured with Eugene Son, a writer on Super Hero Squad, who said that John's performance was fantastic and they were all buzzing about it afterwards.